Thank you for your sweet comments on my last post :-) I was Thrilled to find out there are still some people who stop by my blog. Much appreciated! I had the day off on Wednesday, and finished all the blocks for my Planting seeds tablerunner. This is the one I started in Brenda Riddle's class at Quiltegaarden a couple of weeks ago. 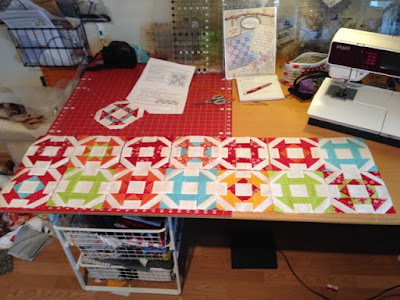 I decided to do free motion quilting in a meandering pattern across the whole table topper. 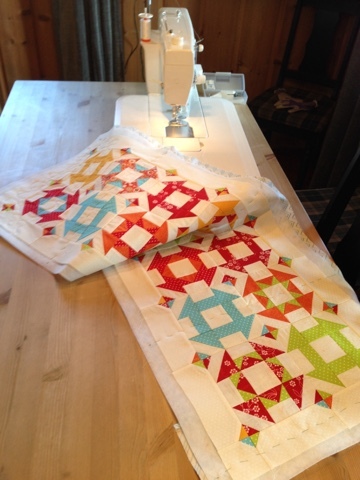 This is the quickest way for me to quilt, and I LOVE free motion quilting! I alway bring my machine to the kitchentable for this, since it is a much sturdier table than my sewingtable. My sewingmachine has a tendency to start "jumping around" when I do my free motion quilting in my sewingroom. I should get a better table, but I just love the size of the one I have. A shot of the runner with the quilting. I have added the binding, and just need to stitch it down. Now I hope we get summer soon since this is my happy summer tablerunner for our outside table :-) No warm temperatures yet, but I keep my fingers crossed! Thank you for stopping by, and have a great weekend! What a happy, bright table runner. 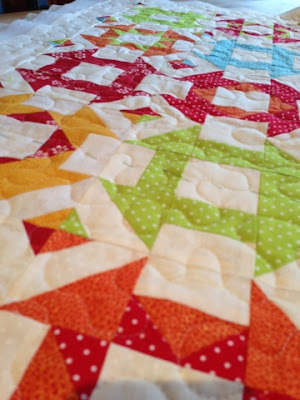 I LOVE that block pattern too -- very pretty! Very pretty colours there Anne Heidi, I agree the colours are summery!